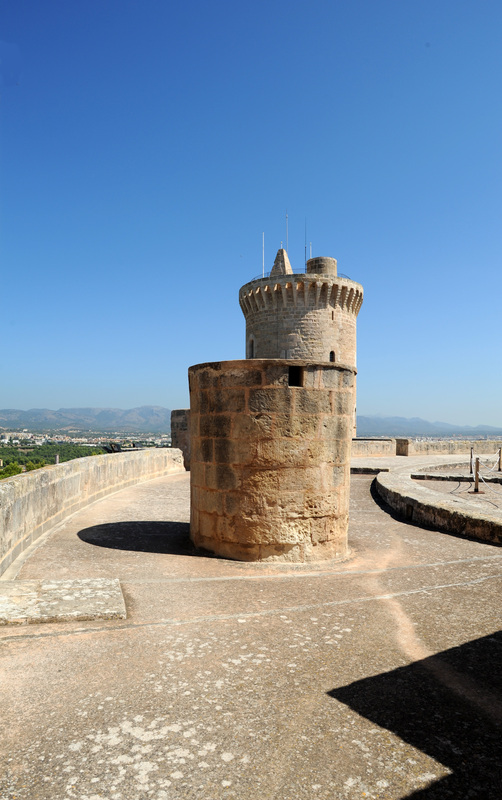 The Bellver Castle is a fortified palace, a circular feature, built for the kings of Majorca to the west of the city of Palma. 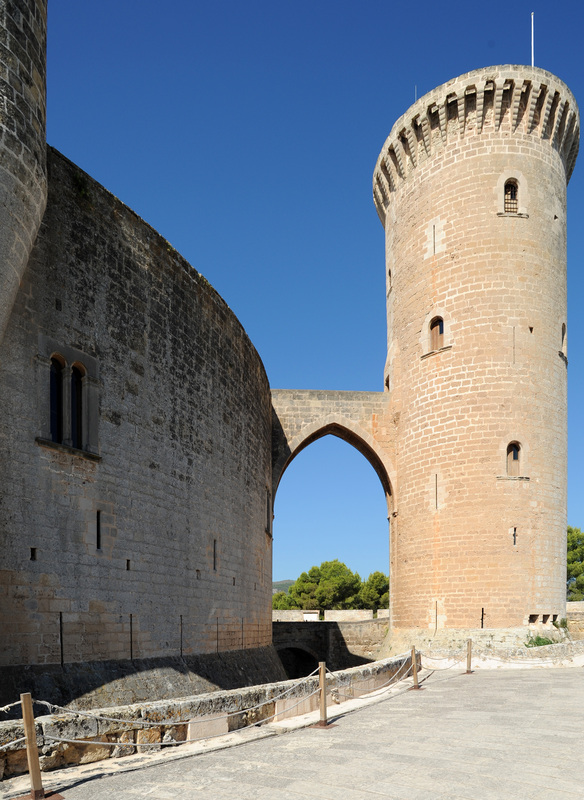 The name of the Bellver Castle comes from medieval Catalan "bell veer" which means "beautiful view", "beautiful see." 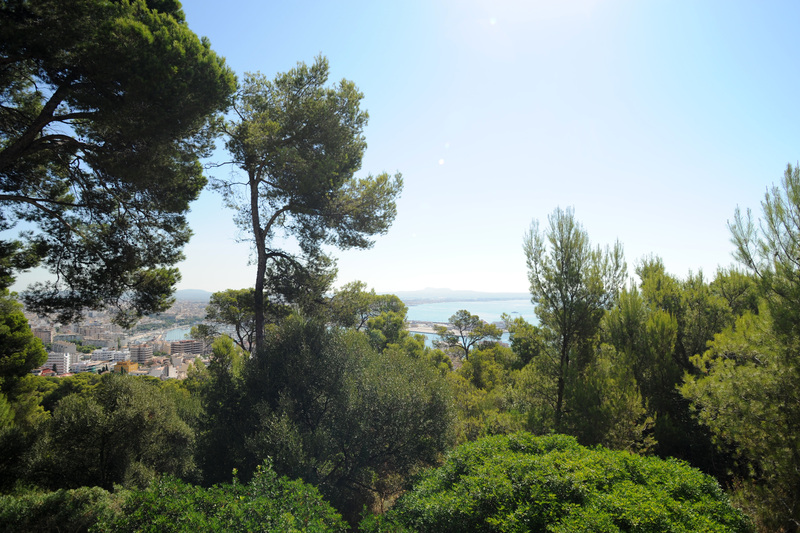 The place has indeed a spectacular view of the city and the bay of Palma. 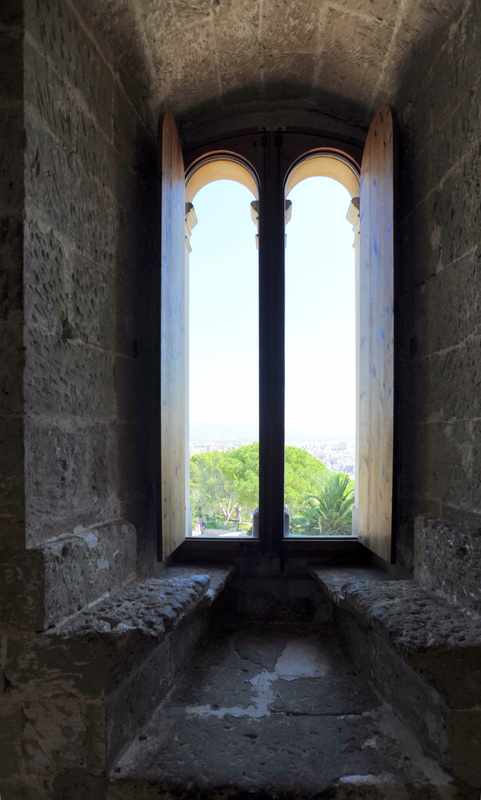 The Castell de Bellver is in a pleasant park located three kilometers west of the historic center of Palma. The castle is built on top of a hill, 112 meters high, covered with fragrant pine wood of Bellver (Bosc de Bellver). 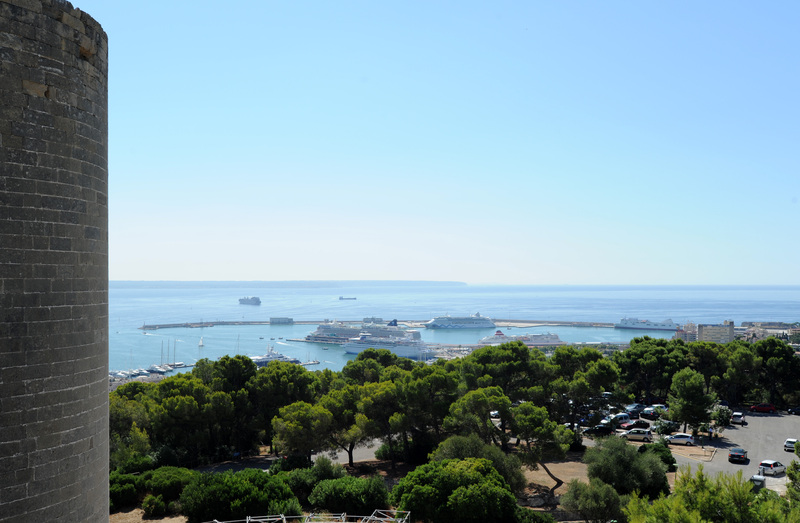 This dominant position with panoramic views over the city of Palma, its bay, its main port and the port of Porto Pi, the mountains of Serra de Tramuntana and to the central plain of Mallorca (Pla de Mallorca). Bellver Castle is a pretty massive Gothic building, but very original, where amazing circular shapes dominate. The two-storey palace, a circular plan, also surrounds a circular courtyard. Like a compass are placed at the four cardinal points, four round towers of defense, three of these towers are backed by the speaker, the fourth tower, the tower is located to the north and separated from the chamber by a ditch, and dominates all. The enclosure and the dungeon is surrounded by a moat of protection. The circular structure of the fortress is unique in Spain and one of the few examples in Europe. Great Tower, or Tower of Homage, rises about 15 meters above the platform. It is crowned with 38 battlements. 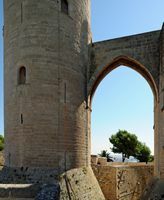 The Tower of Homage is separated by a gap of about 7 meters from the main body of the castle tower is accessed from the terrace a beautiful bridge pointed arch, which is a later construction. The interior of this massive tower is divided into four stages rather dark, lit only by small openings, and interconnected by a spiral staircase. Under the tower is an underground room where access is through a circular hole in the floor of the ground floor, which is closed by a stone lid. 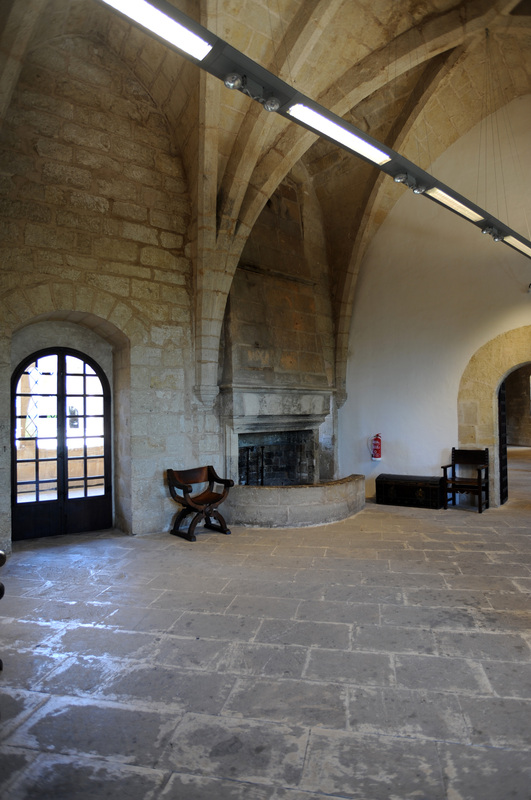 This dark place was intended to be a jail and is known as the "Pot" (S’Olla). This famous prison that inspired novelists, was used until the late 1940s. The other three round towers are located to the east, south and west of the fortress. The only entrance to the castle is via a drawbridge and through a doorway leads to the Weapons Square. 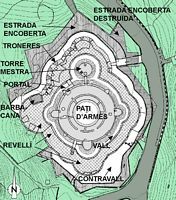 This courtyard or patio (Pati d’Armes), circular in shape, was built on top of a tank of rainwater with a central well. 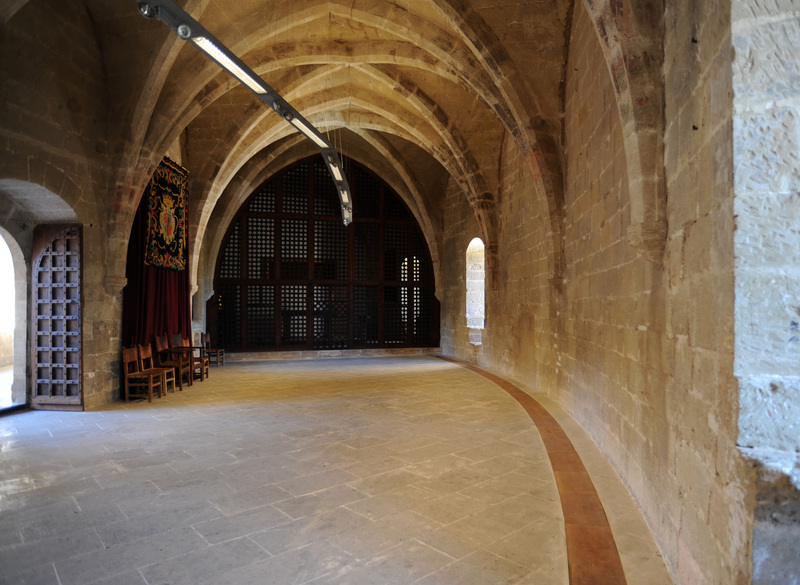 It is bordered by two arcaded galleries on two floors. 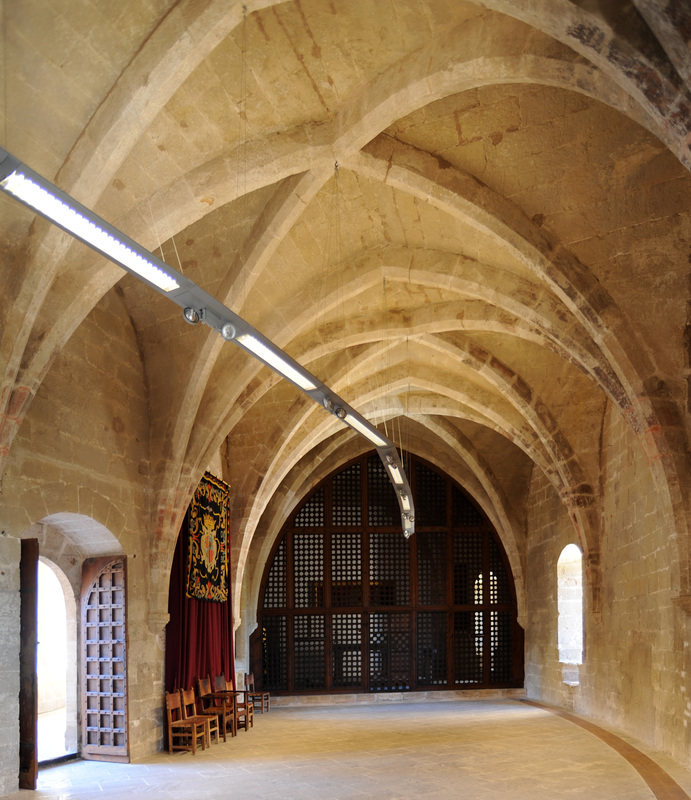 The ground floor has a double gallery consists of twenty-one large arches and a flat ceiling. Under the arches are exposed Roman statues nice size that are part of the legacy of Cardinal Despuig. The gallery on the ground floor serves the halls of the Municipal Museum. Three rooms on the ground floor is devoted to a collection a little disappointing classical statuary, collected by Cardinal Antoni Despuig i Dameto (1745-1813) in his domain of Raixa in Bunyola. 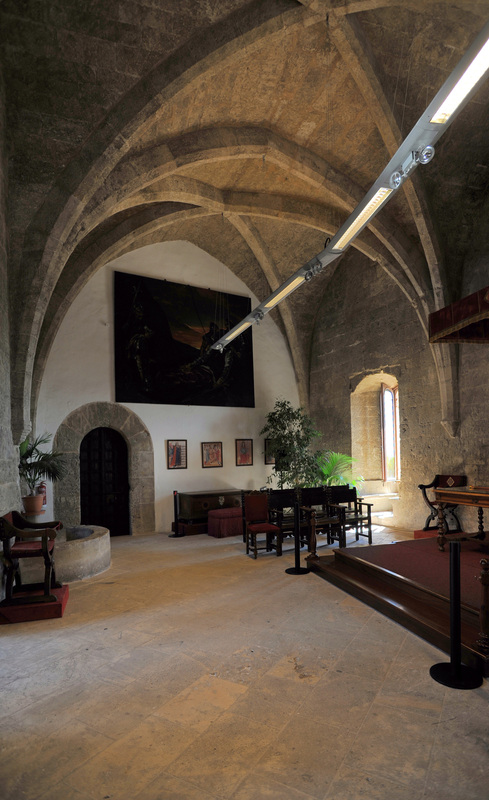 History Museum of the City occupies nine rooms on the ground floor with pieces from archaeological excavations undertaken particularly in ancient Pollentia and municipal art collections, including collections of Italian cardinal Despuig. The History Museum Palma traces the evolution of the city since its founding in 123 BC to the Middle Ages, through pottery of prehistoric periods (talayotic), Roman, Islamic and Spanish. Unfortunately the museum has only a few explanatory signs. The second level is connected by a covered walkway with a ribbed vault of the purest Gothic arches supported by pointed arches. The upstairs gallery has 42 octagonal columns, double the number of columns on the ground floor. 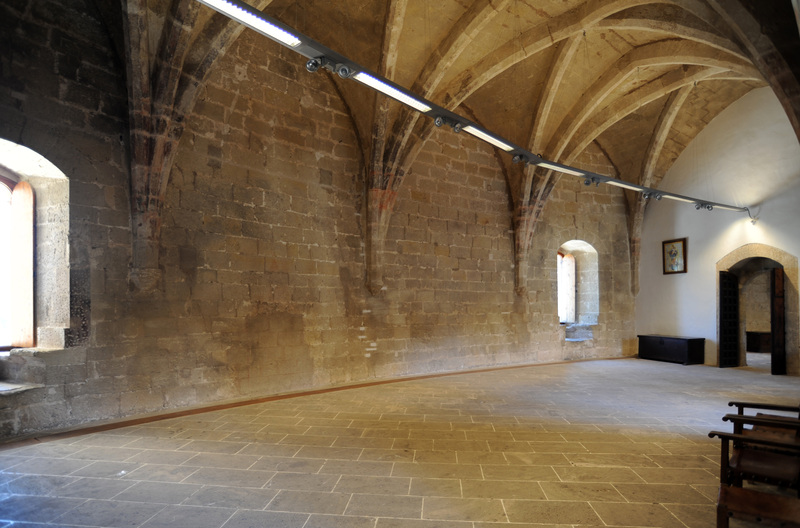 On this floor you can visit a large number of rooms, but are largely empty. 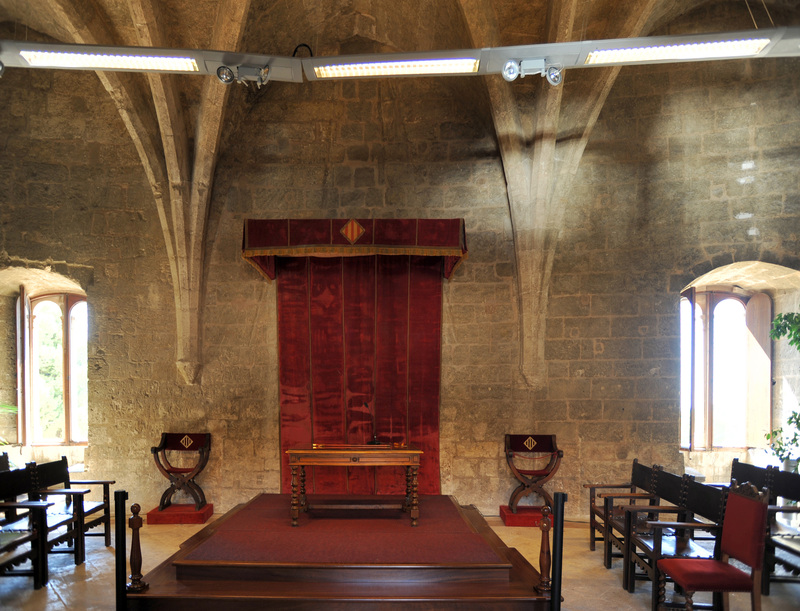 This room, called "Living Jovellanos" would have allowed the writer and former Minister Jovellanos during his political detention. 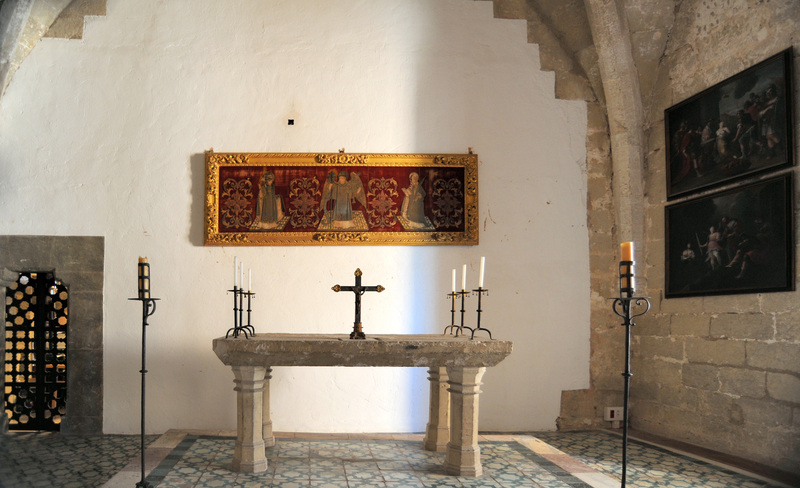 The floor also houses the chapel of St. Mark, the patron saint of the castle. 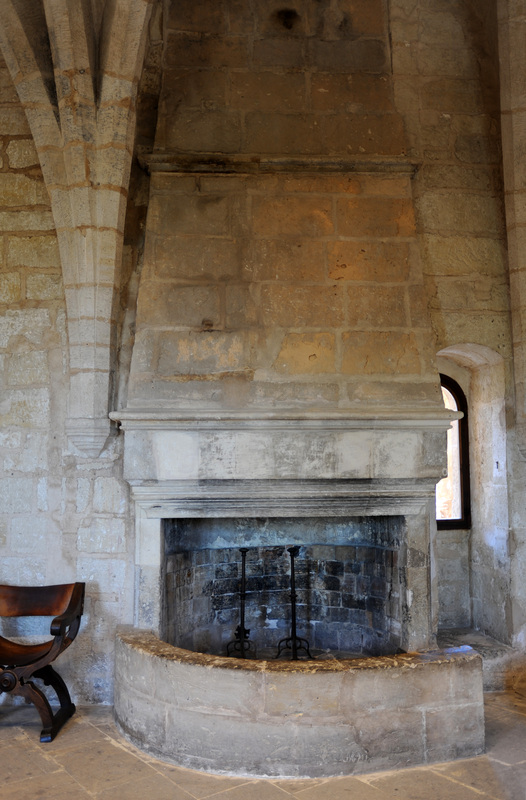 You can see the roof of the castle graffiti carved in stone by prisoners from different eras. Unfortunately, more recent visitors have seen fit to add their own immortal traces the historical evidence. 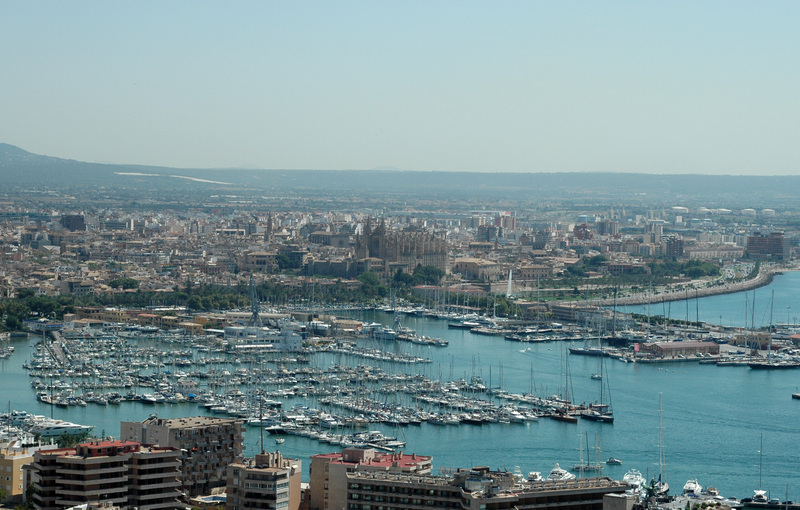 The terrace offers a wide panorama of the area of ​​Palma. 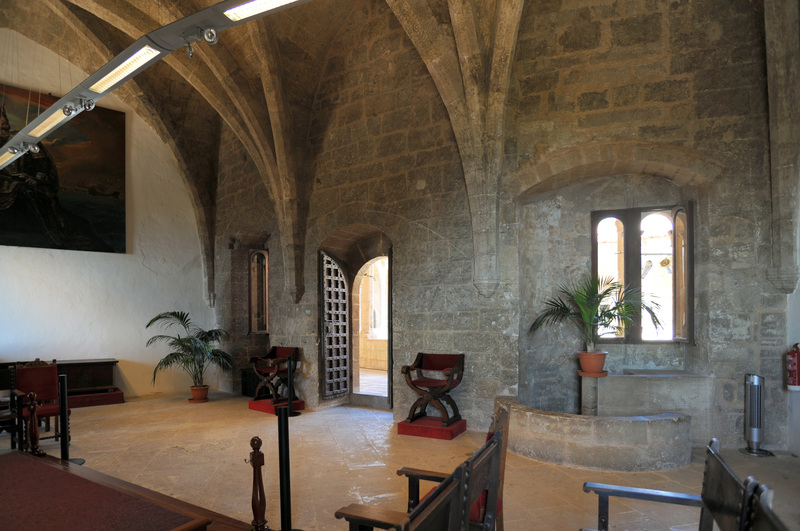 It is very early in the fourteenth century, in 1300, the king James II de Mallorca (Jaume II) built the palace-fortress of Bellver to install the royal summer residence. 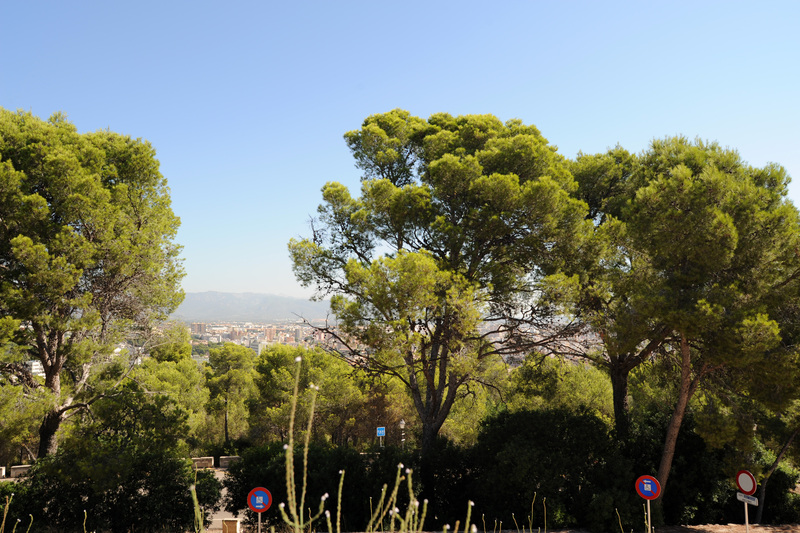 Suffering from tuberculosis, Jaume II wanted a residence in a place with salubrious climate: the top of a hill known as Puig de Sa Mesquida was chosen. 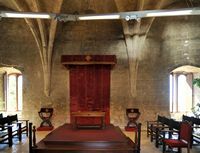 Bellver was to be the summer residence of the kings of Majorca, in the short history of this island kingdom (1276-1349), but it seems that only the king Sanç in 1314 and Joan I of Aragon in 1395, remained there some time. The castle then fell to James III (Jaume III) Mallorca. During the campaign of conquest of Mallorca by Peter IV of Aragon, the Ceremonious (Pedro IV el Ceremonioso), the fortress successfully resisted a siege. But after the defeat and death of James III during the Battle of Llucmajor in 1343, the castle was a prison for the widow of James III and his children. Under the reign of John I (Joan I), son of Peter IV Ceremonial and King of Aragon from 1387 to 1396, the fortress withstood another assault in the first popular revolt in 1391 Germanías. The Bellver Castle served as a defensive position against the Turks. 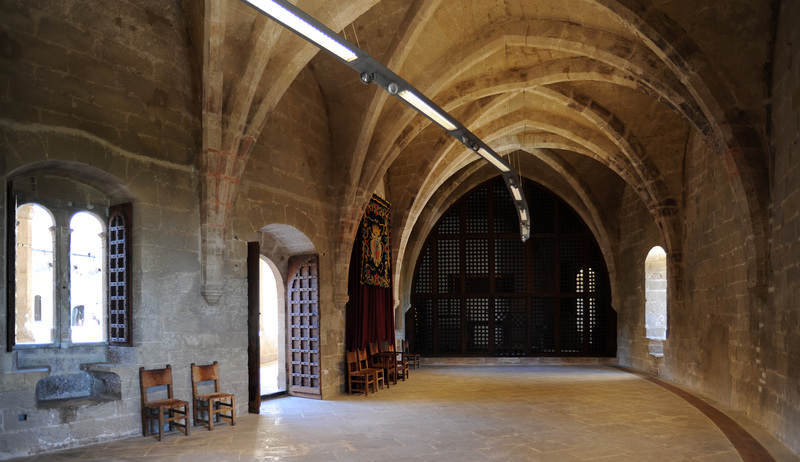 Yolande of Aragon (Violant d’Aragó) resided for some time in Bellver, his taste for the performing arts led him to convert the castle scene for parties, dances and poetry sessions. The castle fell only once in its history at the hands of the enemy: it was in 1521, after an attack during the Second Revolt of the Germanías. During the seventeenth century, the castle was - rarely - used as a residence by the viceroys. 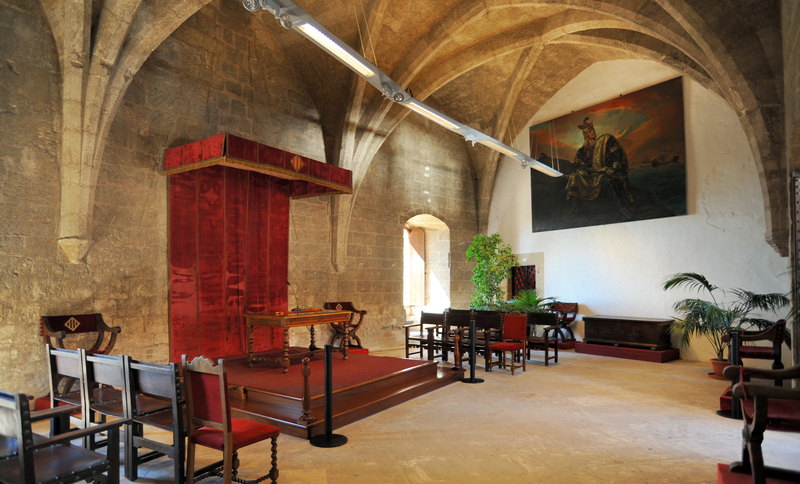 In the eighteenth century, the fortress was used as a political prison during the War of Spanish Succession (1701-1714), first to imprison supporters of Philip of Anjou, and after the victory of the Bourbons, to imprison supporters Habsburg. 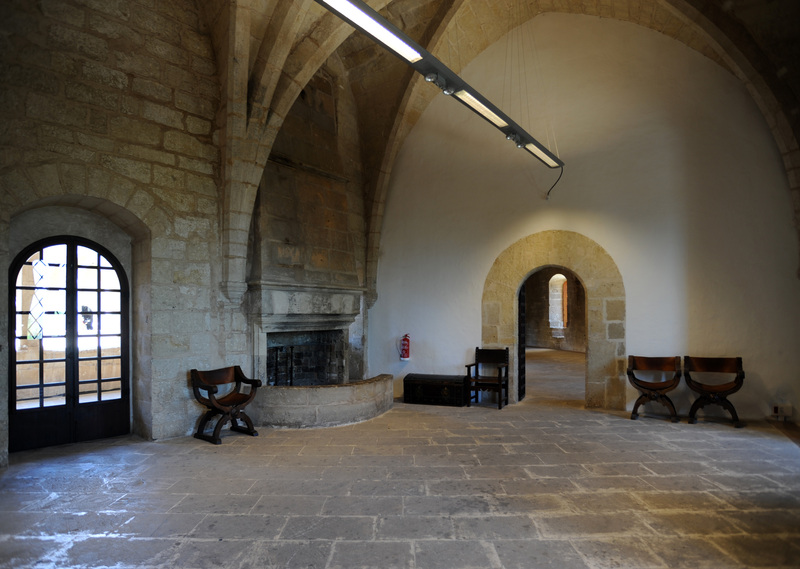 In 1717, it became a military prison, with its own garrison, and retained this role throughout the eighteenth and nineteenth centuries, until the mid-twentieth century. During a period in the nineteenth century, a factory of coins was installed. In the early nineteenth century, from 1802 to 1808, the writer and former Minister Gaspar Melchor de Jovellanos was imprisoned because his rapid political rise was displeased Manuel Godoy. 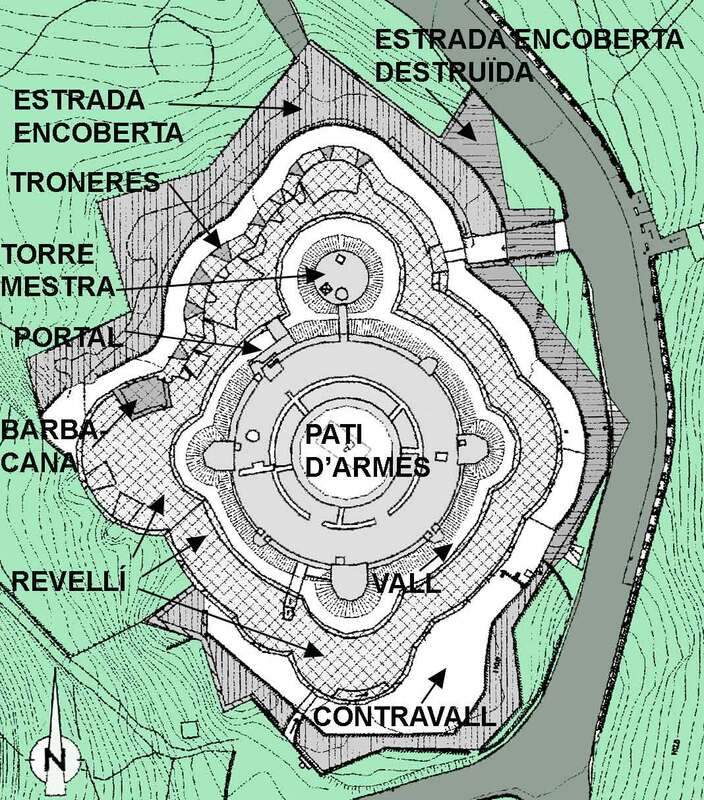 Jovellanos was the first to make a description of the castle and control drawings of it. During the Spanish War of Independence against the Napoleonic Empire, Bellver was used to hold French officers taken prisoner at the Battle of Bailén. François Arago was detained there. 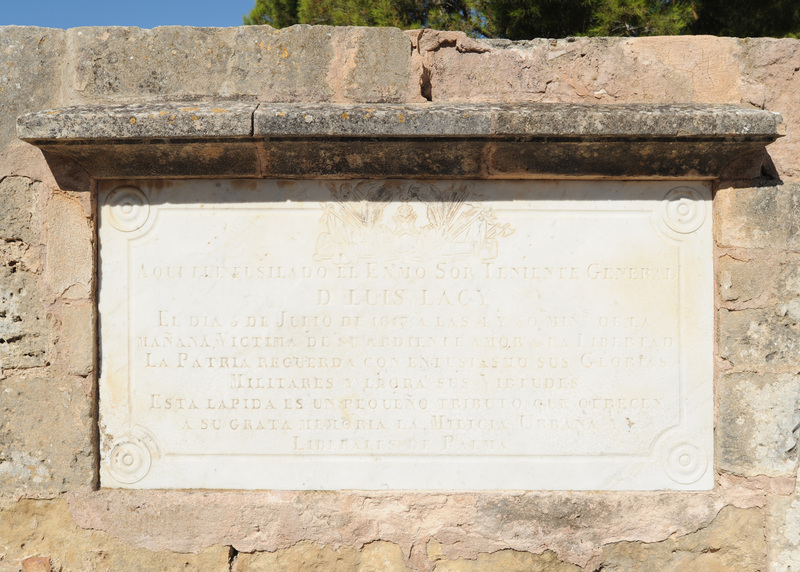 A few years later, July 5, 1817, General Luis Lacy, will be shot in the fortress. The Bellver Castle retained its role as a prison until 1915. 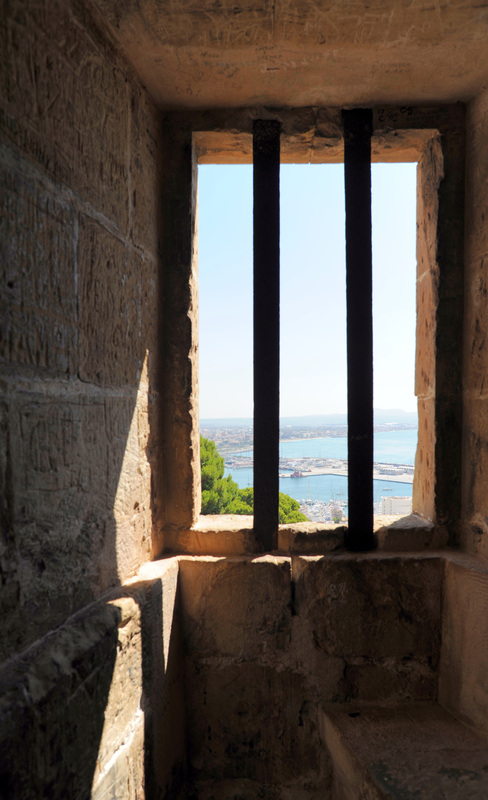 In 1931, he was transferred to the Mayor of Palma, but again became a prison during the Spanish Civil War and later. 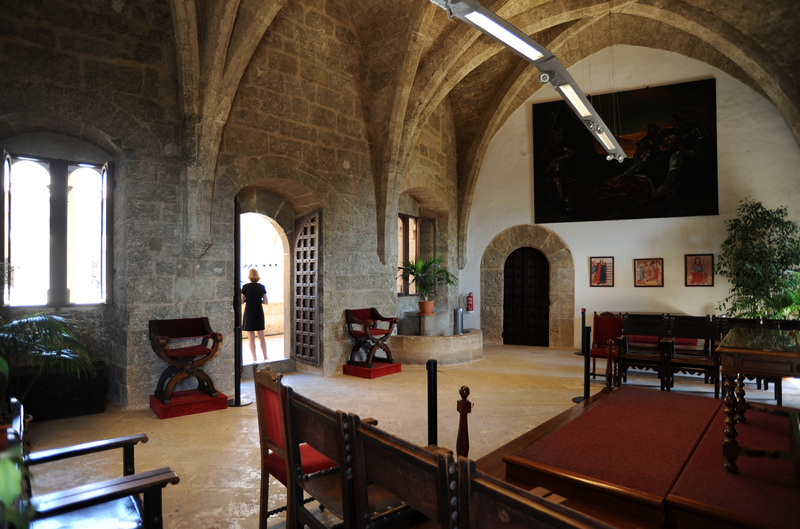 Castle returned to the city of Palma, and now houses the Historical Museum of the City and is used for numerous cultural and leisure activities. 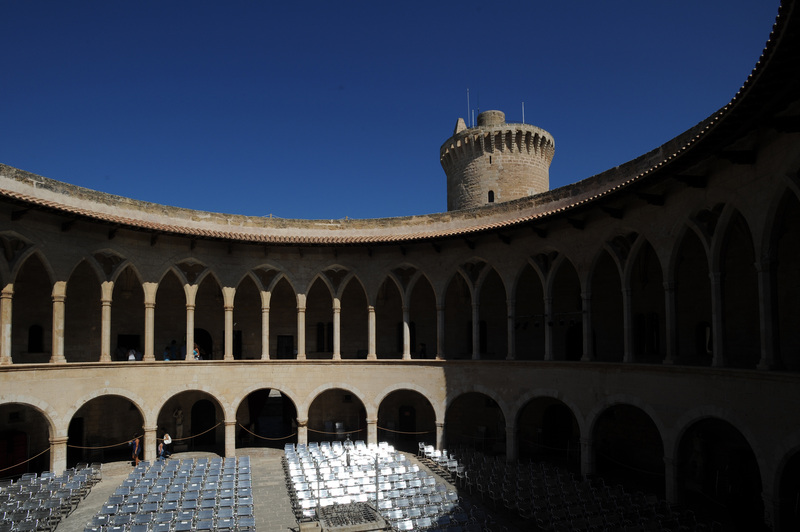 The construction of the palace-fortress of Bellver was entrusted by Jaume II in the Majorcan architect Pere Salvà, who was also the architect of the Royal Palace of Almudaina. The circular plan of the Bellver castle with circular towers also backed, seems to have been inspired by the upper part of the fortress of Herodion, currently located in the West Bank, the Herodion is circular in shape with a large main tower and three small towers attached to the enclosure. Master Pere Salvà was assisted by other builders of the era such masters Francesc Caballer, Ponç Descoll, Pere Tallada, Arnau Llompart and sculptor Antoni Campredon. The castle was built in a decade, from 1300 to 1311, in one go, which gives it a unified appearance of great beauty. 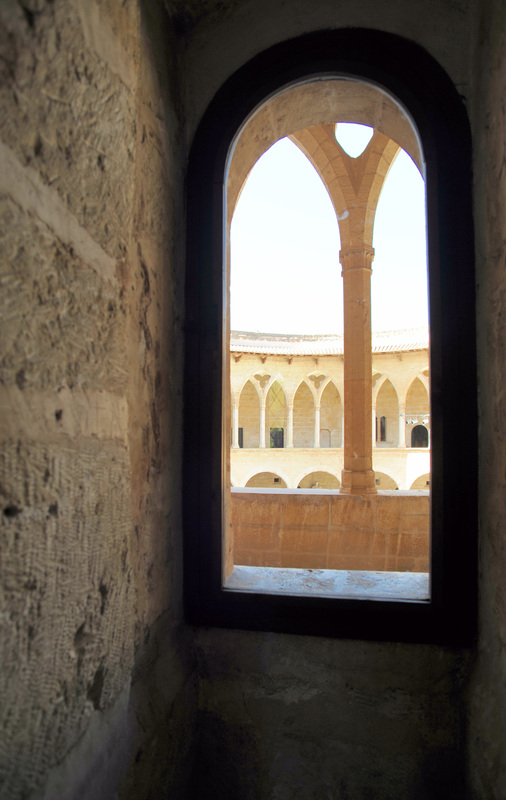 Of Mediterranean Gothic style, Bellver is the only stronghold of Spain with a circular shape. For the construction, we use the rocks of the hill, some of which are located below the castle, this is the cause of the cracks of the building that can be seen today. When they had needed more stones they brought from Portals Vells and Santanyí. Later, in the sixteenth century, after the introduction of artillery, niches of the upper terrace of the Barbican and those disappeared, soon followed by those of each round. Of classical music concerts are held outdoors in the spring and summer to Bellver Castle. Summer hours (April 1 to October 30): Monday to Saturday, from 8:30 to 20:30. Sundays and holidays from 10:00 to 18:30. Winter hours (October 1 to March 31): Monday to Saturday, from 8:30 to 18:45. Sundays and holidays from 10:00 to 16:30. Admission prices: 2,50 €. Admission is free on Sundays, but the halls and museums are closed. Access: tourist bus No. 50 or for those who are not afraid to walk, take bus No. 3 or No. 46 to the plaça Gomila, then reassemble the steep streets above the Carrer de Bellver and stairs through pine woods to the castle (1 km, 15 minutes).